This is one of my favorite soups! I made it once without bacon for my vegan friend– I just used a little oil to cook the vegetables instead. 1. Fry the bacon in a large stockpot or dutch oven over medium-high heat until bacon is crispy. (3-4 minutes) Add the onion, celery, and carrots; cook until vegetables begin to softened. (3-4 minutes) Add the garlic and cook for 30 seconds. Stir in the tomatoes, bay leaf, and thyme; cook another 30 seconds. Stir in the lentils, salt and pepper; cover, reduce heat to medium-low. cook 8-10 minutes. 2. Uncover and increase the heat to high. Add the potatoes, broth and water and bring to a boil. Cover partially, and reduce the heat to low. 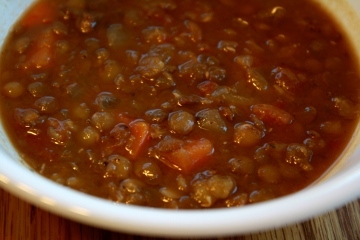 Simmer until the lentils are tender but still hold their shape (30-35 minutes). discard bay leave. One Response to "Hearty Lentil Soup"
We dropped by just in time for dinner and this was delicious! !